Microsoft [MSFT] have made a surprise statement today which mentions a couple of things. First off, it confirms the existence of the Microsoft Courier, but then continues to say the project is now being closed down for the unforeseeable future. The Microsoft Courier was a unique looking device. It had dual screens and worked with both pen and finger input. The idea behind it was to collaborate information with others on various ideas where plans could be shared between users and easily accessed while on the move. It’s a real shame MS had to kill this project off as out of all tablet devices that have been announced, the Courier looked far better than the rest. Lets hope they change plans in the future and put some sort of Windows Phone 7 OS on to it customised for a dual screen configuration. There is something very wrong at Microsoft campus in Redmond. The company is so off target that it keeps developing devices and operating systems that become obsolete before they are released. We saw this with the first version of Windows Mobile 7, which was codenamed Photon, and later scrapped after Microsoft saw the iPhone and what was the future interface style. Other efforts like KIN are evolutionary dead-ends that lead the company nowhere. Time for new management at Microsoft. 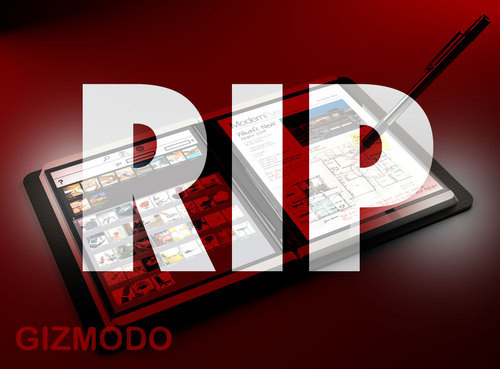 What are Microsoft and HP thinking canceling this device? Let’s hope that they have something else in development that can justify this seemingly insane move. At the right price point the Courier could have been a real winner, crushing competition from both slates and netbooks alike. This device had the potential to humble Apple’s iPad; which to be totally honest, isn’t really that great a device anyway. And before I get the Apple fan boys and girls on my case, I have nothing against Apple. In fact I used to work for them, and have used their computers for over two decades. Microsoft really need to pull their fingers out, and put all of their substantial resources into truly revolutionary products like this one could have been. The lackluster products that they have thrown forth over the past few years are almost embarrassing, especially from a company with the clout they could bring to bear. Maybe new management IS what’s needed at Microsoft.